This work includes essays by Martin Clark, Rod Mengham. It also features an interview with the artist by Andrea Tarsia. Albert Oehlen's work focuses on the process of painting itself rather than any subjective expressionism or formal representation. 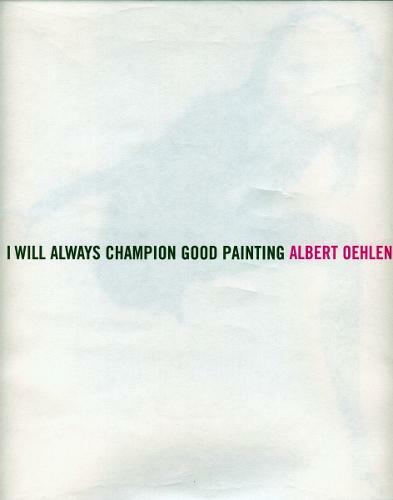 Oehlen once said, 'I want an art where you see how it's made, not what the artist means but the traces of production'. He describes his works as 'post-non-representational', subverting traditional ideas of abstraction and figuration by collapsing together often chaotically eclectic imagery, techniques, subjects and styles. He builds his works up, layer by layer, employing digital print, screen print, collage, oil, acrylic and spraypaint, often all on the same canvas. Albert Oehlen was born in Krefeld, Germany, in 1954. A contemporary and collaborator of Martin Kippenberger, he became involved in the Cologne scene of the 1980s, championing, alongside Werner Buttner and Georg Herold, both 'Bad' painting and the 'Neue Wilde' (New Wild Ones), with which he was briefly associated. Oehlen's work continues, and reacts against, a tradition of German painters that include Georg Baselitz, Gerhard Richter, Jorg Immendorff and Anselm Kiefer. The catalogue is published on the occasion of the exhibitions: 'I Will Always Champion Good Painting' at the Whitechapel Gallery, London, and 'I Will Always Champion Bad Painting' at Arnolfini in Bristol.